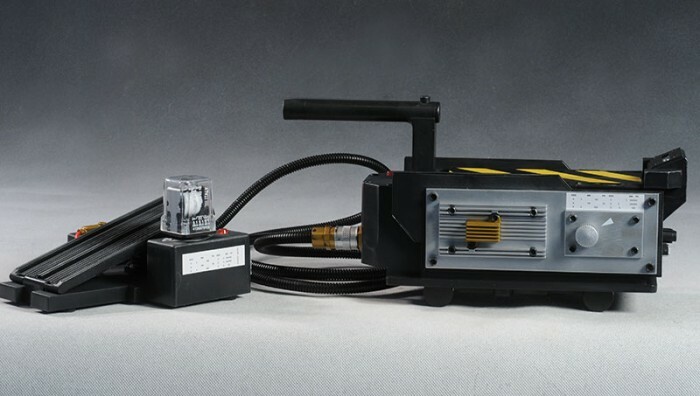 A piece of ghostbusting equipment almost as important as the proton pack in the Ghostbusters universe, the ghost trap was used for detaining and transporting "busted" ghosts until they could be safely stuffed into the Ecto Containment Unit. Believed by some to entrap the ghost with a laser containment field, precisely how the trap works was never fully explained in the films. For filming, the production utilized hero, stunt, and smoking traps. The hero traps were designed to be cosmetically appealing (including a removable trap "cartridge" and rolling wheels), while the stunt traps were made for action sequences. The smoking traps included strips of fabric along the sides to which an SFX smoking liquid was applied, giving the appearance of a recently-trapped spook. 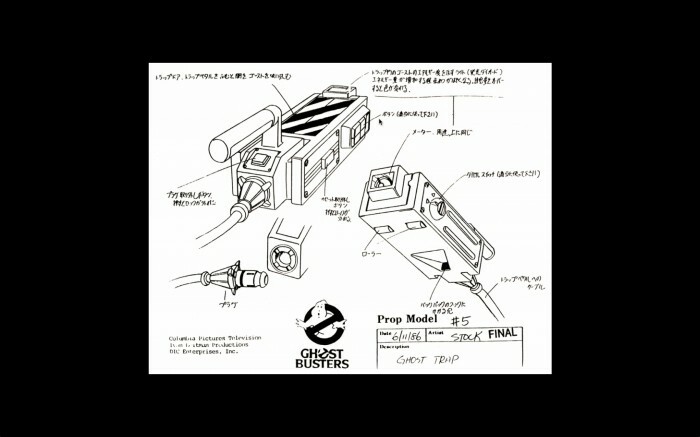 The ghost traps were worn on the Ghostbusters' belts via a custom belt attachment, and each included a pedal for opening the trap remotely while a ghost was held in the proton pack's containment stream. Although the traps look similar in both Ghostbusters 1 and 2, there are subtle differences in several details as well as overall shape. Most noticeable is the colour of the tubes on the left side of the trap. These were red in GB1 and silver in GB2 . It is believed the smaller size of the trap in Ghostbusters 2 was because the actors complained about the weight of the traps. Like the proton pack, the ghost trap has been exhibited by Planet Hollywood. In Ghostbusters, Ray advises Egon against looking at the trap. In the Braxtan fanfilm, Return of the Ghostbusters, this comment is expanded upon, the characters describing how the soul can be pulled through the eyes into a trap, subsequently being stored like a ghost. However, as evidenced in the films it is more likely that looking directly into the trap will blind you, not steal your soul. In Ghostbusters it was simply that Egon was not close enough to be blinded by the trap, but was clearly bothered by looking into the Ghost Trap. In Ghostbusters II all three Ghostbusters look away when the trap is opened during the courtroom scene. During the montage when Peter opens the trap he has his eyes closed, evidenced when he says, "bye-bye." Ray was not affected by the opening trap because he was wearing the Ecto-Goggles. The ghost trap in the cartoon functioned similarly to the one in the movie, albeit with slight changes. The trap could now capture more than one entity at a time. Whenever two or more ghosts were captured in the same trap, their molecules would merge, combining them into one entity. It is suggested that opening the trap would allow both entities to un-bind and escape, but this has never been explored. Also, the blinking indicator light is now the front bar graph as opposed to the small red light in the back. 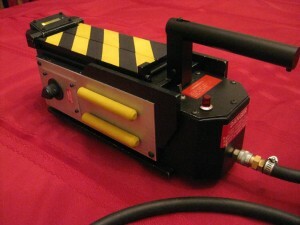 Mattel's first 1:1 replica of the ghost trap was released in October 2011. Announced at the 2011 San Diego Comic Con, the trap includes numerous features that mimic the actual ghost trap from the movies, and Ghostbusters: The Video Game.The trap has two different types of modes; during "movie" mode, the trap "shakes" to simulate as if a ghost has been captured inside. Also includes both red and silver interchangeable side power bars to easily switch between "Ghostbusters" and "Ghostbusters II." The prop replica also comes attached with the pedal that is fully functional alongside the trap.